This post is sponsored by Catch Bliss. Today I just wanted to share a little bit of fashion inspiration with you all. I realize that most people post a "What I Wore Wednesday" but with all the Christmas prep, I'm running a bit late this week, so this is "What I Wore Thursday". One of my favorite things about the cold weather is getting to layer. And more specifically getting to wear cozy sweaters. In this outfit, I wore this great asymmetrical, Aztec print sweater from Catch Bliss boutique. I love the gray and brown color scheme and the asymmetrical hem gives it an unexpected and fun edge. 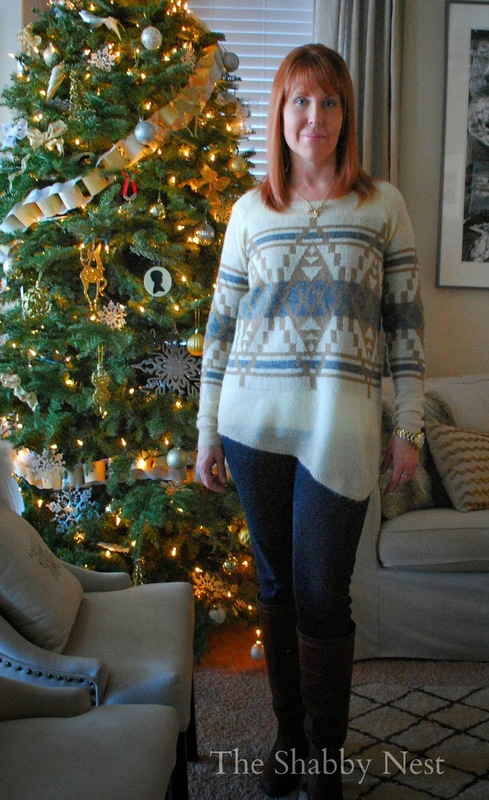 I paired the sweater with a dark navy skinny jeans by Vera Wang and tall riding boots from Target. To finish the look I added gold jewelry - including an adorable deer head necklace also from Target. Catch Bliss is a new-to-me online boutique. They have some really fun clothes at reasonable prices and right now, you can 30% off anything in the store by using the code CB30. I love me a great deal at Christmas time! Oh! And if you don't follow me on Instagram, you didn't get the first sneak peek at my RED HAIR! That's right, folks! After years of being a blonde...I've gone red! I'm loving it so far! But every time I catch a glimpse of myself in the mirror, It still startles me for a minute. Lol! So make sure to follow me on Instagram for all the fun behind-the-scenes moments!! I received my sweater free of charge in exchange for a review. However, the opinions expressed are 100% mine. Stunning, but enough subtle to let your beauty shine through! !